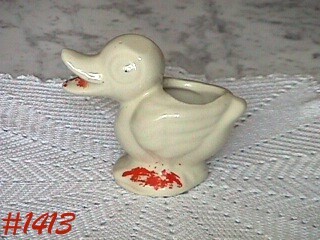 THIS IS THE FINEST MCCOY DUCK AND CART PLANTER I HAVE SEEN! IT'S A MATTE FINISH AQUA COLOR AND HAS APPROXIMATELY 95% OF ITS ORIGINAL COLD PAINT -- UNBELIEVABLE. IT'S IN EXCELLENT CONDITION WITH ONLY 2 DOT SIZE GLAZE FLECKS -- ONE IS ON A WING AND ONE IS ON THE CART TOP EDGE -- THAT'S IT! HAS A PRODUCTION NON-GLAZE/NON-COLOR ON A WHEEL -- OF ABSOLUTELY NO CONSEQUENCE. PLANTER IS MARKED: MCCOY. SIMPLY OUTSTANDING CONDITION AND IN A COLOR AND GLAZE FINISH THAT IS NOT YOUR EVERYDAY FIND! SUPER ITEM. WOW -- WHAT A TREASURE! THIS IS MCCOY'S PEACOCK FLOWER ORNAMENT -- REFERRED TO AS A "LADDER PIECE" BY COLLECTORS. EXCELLENT CONDITION -- NO CHIPS, NO CRACKS, VIRTUALLY NO CRAZING! HAS A FEW TYPICAL MCCOY PRODUCTION PIN-POPS, ETC -- NOTHING WORTHY OF MENTION. A PRIZED ADDITION TO ANY MCCOY COLLECTION! ANOTHER VERY DETAILED MCCOY PLANTER! 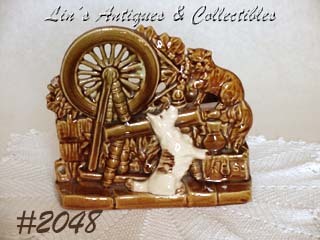 THIS IS THE SPINNING WHEEL PLANTER WITH A CAT SITTING AT ONE END BECAUSE THE DOG IS AFTER HER! SHE HAS A PAW RAISED AND HER VERY DETAILED FACE SHOWS JUST HOW OFFENDED SHE IS BY THIS NUISANCE. DOGGIE IS SITTING ON HIS HINEY AND SEEMS QUITE PERPLEXED THAT THE CAT DOESN'T WANT TO RUN SO HE CAN CHASE HER -- HE'S A HAPPY DOG. PLANTER COLORS ARE BEAUTIFUL -- WARM HONEY COLOR WITH ACCENTS IN SHADES OF GREEN, DOG IS WHITE WITH TAN ACCENTS -- COMPLETE PLANTER HAS A CLEAR SHINY GLAZE. MARKED ON BOTTOM: MCCOY, USA. IN GREAT CONDITION -- THE SPINNING WHEEL HAS A 3/8" SUPER TIGHT AND GLAZED PRODUCTION STRESS. ONLY "USE" EVIDENCE IS A 1/8" SUPER TIGHT HAIRLINE ON BACK RIM, A 1/16" GLAZE RUB OR DING BY THE HAIRLINE AND THE DOGGIE HAS A 1/8" SLICE TYPE GLAZE DING ON ONE EAR (NOT VISUALLY NOTICEABLE BUT CAN BE FELT). THESE IMPERFECTIONS ARE SMALL AND NOT DETRIMENTAL. BEAUTIFUL PLANTER. NEAT MCCOY HORSE PLANTER! 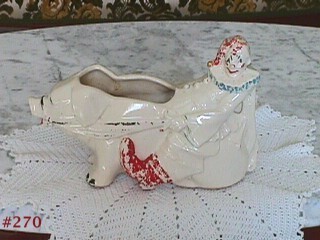 MADE IN THE 1940's, PLANTER IS SHAPED LIKE A LITTLE HORSE (PLANTER PART IS ON BACK SIDE) AND IS IN PRETTY WHITE COLOR. HAS VERY HEAVY GLAZE, IT IS MARKED WITH THE OVERLAPPING NM MARK BUT IT'S DIFFICULT TO SEE BECAUSE OF GLAZE. 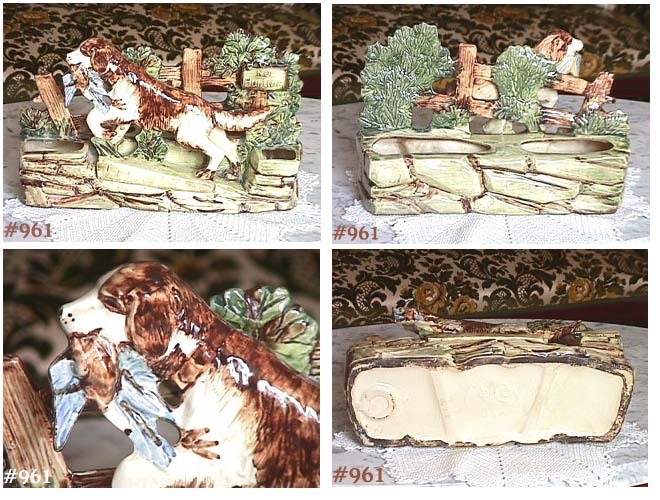 THIS IS A VERY NICE PLANTER THAT IS LISTED AS #18 OF THE TOP 100 MCCOY COLLECTIBLES. HOWEVER, IT IS NOT WITHOUT PROBLEMS AND HAS BEEN PRICED ACCORDINGLY -- IT HAS A 3/8" X 7/16" SLICE TYPE CHIP ON ONE FRONT FOOT -- SINCE PLANTER IS WHITE, IT DOESN'T JUMP OUT AT YOU. THERE IS A GLAZE CHIP ON RIM OF PLANTER THAT MAY HAVE BEEN RE-GLUED BUT IT LOOKS LIKE IT HAS GLAZE AT TOP SO I THINK IT'S JUST A "BRUISE". THERE IS A SUPER TIGHT HAIRLINE THAT BEGINS AT RIM CORNER OF PLANTER (NEXT TO HORSE) AND EXTENDS 2 1/2" DOWN PLANTER AND AROUND TO HORSE'S FRONT LEG. HAIRLINE IS TIGHT AND DOESN'T GO THROUGH TO INSIDE -- IT'S LIKE A PENCIL MARK. FROM MY DESCRIPTION, PLANTER SOUNDS AWFUL DOESN'T IT? IT'S NOT -- BUT IT'S NOT PERFECT. THIS IS A DIFFICULT TO FIND ITEM IN A DIFFICULT TO FIND COLOR. CUTE LITTLE UNMARKED MCCOY PLANTER! THIS ONE IS A BABY DUCK, MEASURES 3 3/4" TALL, AND IS A SOFT WHITE COLOR. HE HAS APPROXIMATELY 45% OF ORIGINAL COLD PAINT. HAS NO CHIPS OR CRACKS. BOTTOM DRY RING HAS A COUPLE SMALL PRODUCTION STRESS MARKS -- THEY ARE GLAZED OVER AND NOT DETRIMENTAL. LITTLE DUCK HAS A FLAT SPOT ON TOP SIDE OF HIS HEAD -- PRODUCTION -- HAS GLAZE AND COLOR -- KINDA CUTE! 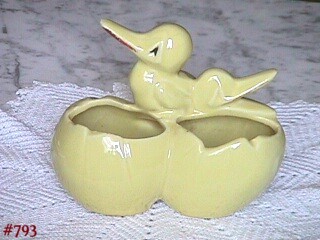 I THINK THIS IS ONE OF MCCOY'S CUTEST LITTLE DUCK PLANTERS! THE PLANTER CONSISTS OF TWO BABY DUCKS AND THEIR RECENTLY VACATED EGG SHELLS. THIS ONE IS IN A VERY PRETTY SOFT PINK COLOR, MEASURES 5 1/2" TALL (BOTTOM TO TALLEST PART), ABOUT 5 3/4" LONG, AND 3" WIDE. MARKED ON BOTTOM OF ONE EGG: MCCOY. MARKED ON OTHER EGG: MADE IN U.S.A. ONLY EVIDENCE OF "USE" IS VERY, VERY MINOR COLD PAINT LOSS! PLANTER HAS NO CHIPS, NO CRACKS, NO CRAZING! HAS A FEW TYPICAL MCCOY PIN POPS AND A 1/2" PRODUCTION STRESS INSIDE BOTTOM -- NOTHING DETRIMENTAL TO USE AND IN NO WAY DISTRACTING TO APPEARANCE. PLANTER HAS ALWAYS BEEN PAMPERED -- SHOWS NO EVIDENCE OF EVER HAVING BEEN USED AS A PLANTER, BOTTOM DRY RINGS AREN'T EVEN DIRTY/STAINED! A WONDERFUL ADDITION TO ANY MCCOY COLLECTION. WOW! 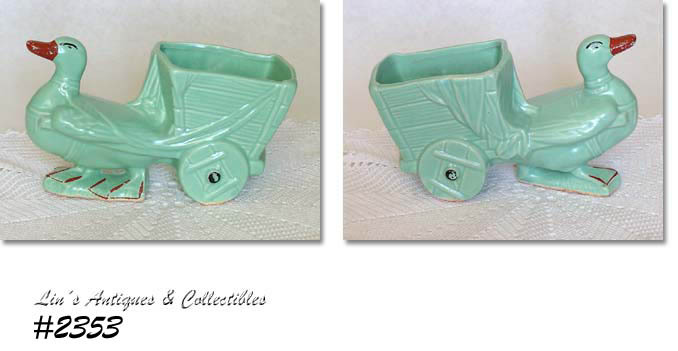 THIS MCCOY PLANTER IS LISTED AS #74 OF HANSON'S TOP 100 MCCOY COLLECTIBLE PIECES. EASY TO SEE WHY -- IT IS VERY LARGE WITH EXCEPTIONAL COLORING AND GREAT ATTENTION TO DETAIL. MEASURES 12 1/2" LONG, 8 1/2" TALL. HAS A BIRD DOG (OOPS! HE CAUGHT A BIRD!) AND HE'S STANDING IN FRONT OF A "NO HUNTING" SIGN! PLANTER IS MARKED ON BOTTOM: MCCOY, USA. HAS NO CRACKS, HAS 2 SUPER TINY (1/16") DINGS ON BACK RIM EDGE (BEHIND FENCE) -- OF NO CONSEQUENCE, THEY'RE SO SMALL! PLANTER HAS LIGHT GLAZE CRAZING. AN OUTSTANDING PIECE! 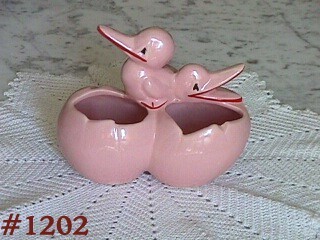 MADE IN 1948, THIS MCCOY PLANTER IS SHAPED LIKE 2 DUCKLINGS WITH THEIR NEWLY VACATED EGG HOMES! IS IN A VERY PRETTY YELLOW COLOR WITH A SHINY GLAZE. MARKED ON BOTTOM: MCCOY (ON ONE EGG) AND MADE IN USA (ON OTHER EGG). PLANTER HAS BEEN WELL CARED FOR, HOWEVER, THE "BRIDGE" THAT JOINS THE 2 SHELLS TOGETHER HAS A VERY FINE STRESS MARK (LIKE A PENCIL MARK). ONE LITTLE DUCK HAS COUPLE CRAZING MARKS ON HIS HEAD AND EGG RIM HAS WHAT APPEARS TO BE A "DING". HOWEVER, UPON CLOSER INSPECTION, IT IS A SMALL PRODUCTION DARK SPOT -- HAS GLAZE OVER IT. THIS IS A REALLY NEAT PLANTER THAT IS NOT EASILY FOUND -- DON'T BE DETERRED BY MY VERY "PICKY" DESCRIPTION. IT'S NICE. 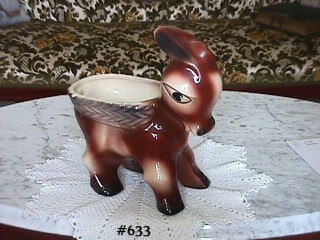 THIS IS A REALLY CUTE MCCOY PLANTER -- SHAPED LIKE A LARGE DONKEY!IT'S A LARGE SIZE -- MEASURES 10" FROM FOOT TO EARS, IS ABOUT 8 1/2" LONG, AND 4 1/4" WIDE. MADE IN 1972 AND IS IN WONDERFUL CONDITION -- HAS SUPER TINY DING ON UNDERNEATH PART OF 1 FOOT AND HAS LIGHT GLAZE CRAZING. A BEAUTIFUL UNMARKED MCCOY PIECE THAT IS A DIFFICULT FIND! MADE IN 1951, THIS IS MCCOY'S CLOWN WITH PIG PLANTER! PLANTER HAS APPROXIMATELY 65% OF ORIGINAL COLD PAINT. MARKED MCCOY USA ON BOTTOM. IT IS IN VERY GOOD CONDITION -- HAS NORMAL AGE CRAZING, 1 SMALL CHIP ABOUT 1/8" ON PIG'S SNOUT, AND 1 SMALL CHIP ABOUT 1/4" ON BACK OF PLANTER. CLOWN HAS A SUPER TIGHT HAIRLINE RUNNING THROUGH HIS BUTTONS. HAS 3 TYPICAL MCCOY PRODUCTION PIN POPS. EVEN WITH THIS "USE" EVIDENCE, THIS IS A VERY NICE AND COLLECTIBLE PIECE. ANOTHER LOVELY MCCOY PLANTER! 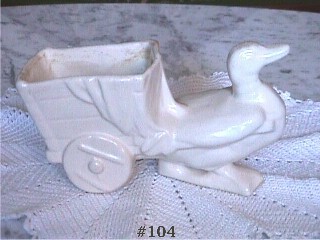 THIS ONE IS THE GOOSE WITH CART AND WAS MADE IN THE 1940's. PLANTER IS WHITE WITH A SEMI-MATTE GLAZE AND IS IN WONDERFUL CONDITION -- IT HAS NO CHIPS OR CRACKS, DOES HAVE SOME CRAZING. IT HAS BEEN USED AS INTENDED AND HAS SOME SCALING/MINERAL DEPOSITS ALONG RIM EDGE. THIS IS A VERY NICE FIGURAL PLANTER THAT CAN BE USED -- JUST THE RIGHT SIZE FOR A VIOLET OR SMALL CACTUS!